The Legend Spirit Contemporary gas fire is a similar product to the Vantage model, only with a shallower heatbox. The depth of the fire is 140mm, making it compatible for installation within shallower chimneys or pre cast flues with a fireplace rebate of at least 75mm and built after 1985. This fire produces a 3.5kw output of heat, and the flame effect is extremely realistic. A glowing fuel bed gives even more to the lifelike look of this model, providing the perfect focal point in any home. When it comes to design, owners have their choice of a number of interchangeable magnetic trims, in either contemporary or traditional designs. Options for your trim include brushed steel, chrome, brass and black. 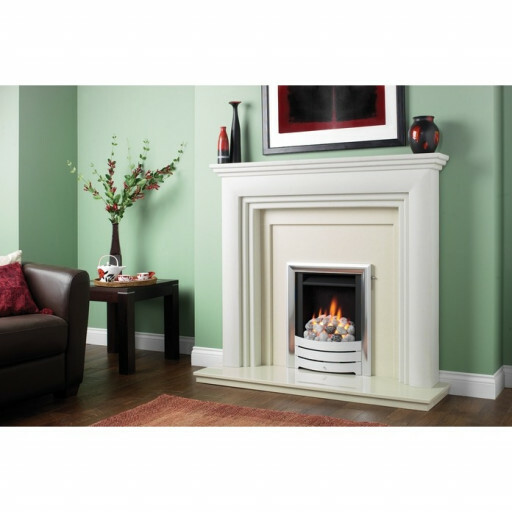 The Legend Spirit Contemporary Gas Fire will perfectly compliment homes with a modern design. This is an open-front, inset gas fire and comes with manual controls, but you have the option to upgrade to a slide or to remote control operation. The fire comes with a comprehensive 5 year manufacturer’s warranty and we also provide affordable financing solutions.